Capacity utilization refers to the manufacturing and production capabilities that are being utilized by a nation or enterpriseCorporationWhat is a corporation? A corporation is a legal entity created by individuals, stockholders, or shareholders, with the purpose of operating for profit. The creation involves a legal process called incorporation where legal documents containing the primary purpose of the business, name, and location at any given time. It is the relationship between the output produced with the given resources and the potential output that can be produced if capacity was fully used. Capacity utilization can also be defined as the metric used to calculate the rate at which the prospective levels of output are being met or used. The rate is displayed as a percentage and provides an insight into the total utilization of resources and how a company can increase its output without increasing the costs associated with production. The capital utilization rate is also called the operating rate. It is unlikely that an economy or company will function at a 100% capacity rate as there are always hurdles in the production process (such as the malfunction of equipment or unequal distribution of resources). A rate of 85% is considered the optimal rate for most companies. The capacity utilization rate is used by companies that manufacture physical products and not services because it is easier to quantify goods than services. If demand in the market increases, it will raise the capacity utilization rate, but if demand decreases, the rate will fall. Economists use capacity utilization as an indicator of inflationInflationInflation is an economic concept that refers to increases in the price level of goods over a set period of time. The cause for inflation in the short and me pressures. A low capacity utilization rate will result in an increase in price inflation because there are excess capacity and insufficient demand for the output produced. Another indicator of the capacity utilization rate is how well the different factors of production are being used. Economies with a capacity ratio of less than 100% can significantly boost production without affecting the associated costs. Many capitalist economies face high excess capacity rates, and economists use the rate as an argument against capitalismCapitalismCapitalism is an economic system that allows for and encourages the private ownership of businesses that operate to generate profit. Also known as the market system, capitalism is characterized by private land ownership rights, competitive markets, the stable rule of law, freely operating capital markets, low, stating that resources are not as well allocated as they could be. However, regardless of economic conditions, there will never be full capacity utilization as inefficiencies in resource allocation always exist in an economy. The capacity utilization rate is an important indicator for companies because it can be used to assess its operating efficiency and provides an insight into its cost structureCost StructureCost structure refers to the types of expenses a business incurs, and it is typically composed of fixed and variable costs. Fixed costs are costs that remain unchanged regardless of the amount of output a company produces, while variable costs change with production volume.. It can be used to determine the level at which costs per unit go up or fall. When there is a rise in output, the average cost of production will decrease. It means that the higher the capacity utilization, the lower the cost per unit, allowing a business to gain an edge over its competitors. This is why many large companies aim to produce as close to the full capacity rate (100%) as possible. Low capacity utilization is a problem for fiscal and monetary policymakers who use such policies to stimulate the economy. In 2015 and 2016, many European economies such as France and Spain struggled with the consequences of low capacity utilization. Despite the governments’ intervention through historically low interest rates, inflation remained significantly low with a threat of deflation. The low capacity utilization led to high unemployment that created slack in the economy, making it hard for prices to react to monetary stimulus. With excess capacity, an increase in the production of goods did not require a significant investment in capital. In addition, a company with low capacity utilization is able to increase its rate of production with no recurring costs. In other words, when a company faces an increase in demand for its goods, it is able to meet the demand without raising the cost per unit. The company can optimize its output level with no additional cost for investment in better infrastructure. The capacity utilization rate is useful to companies as it provides an insight into the value of production and the resources being utilized at any given time. It determines the company’s ability to cope with a rise in the production of output without increasing costs. 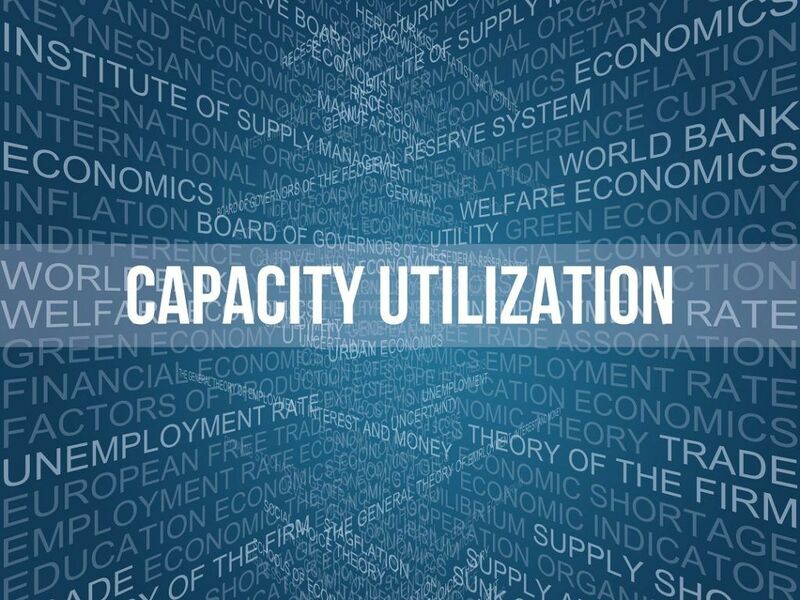 Although the capacity utilization rate is useful for making business decisions, it does not provide enough information for economic and market conditions. A reduction in the capacity utilization rate indicates an economic slowdown while an increase signifies economic expansion.